It’s come to that time of year when I start organising the house and stationery for the children to go back to school. 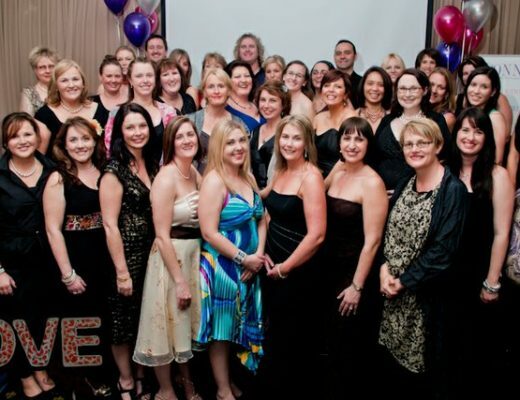 Having had children in school for over a decade now, I find it pays to invest in organising systems to ensure the year goes off without a hitch and runs smoothly throughout the year. I already have good systems in place, however they need refining and reorganising, and I’m using a Brother PT-D400 labeller to help me do that. It’s addictive! I want to label everything! 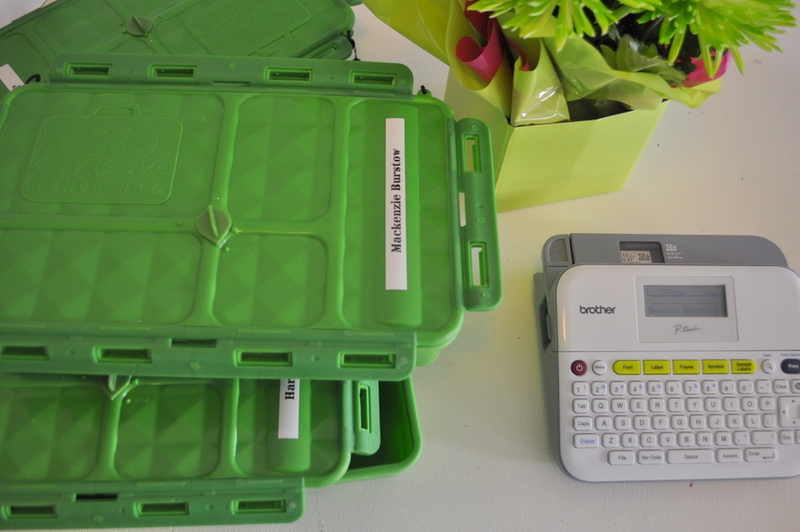 The Brother PT-D400 is an easy to use labelling machine with a large keypad for typing and heaps of options. There are 14 different fonts, 99 frames and over 600 symbols. I like how the machine provides the option for batteries or wall plug in, plus you don’t need to buy toner ever, just replacement tape. It’s super-quick too: just type in the words and print. I’ll show you some of the ways I use the labeller around my home. 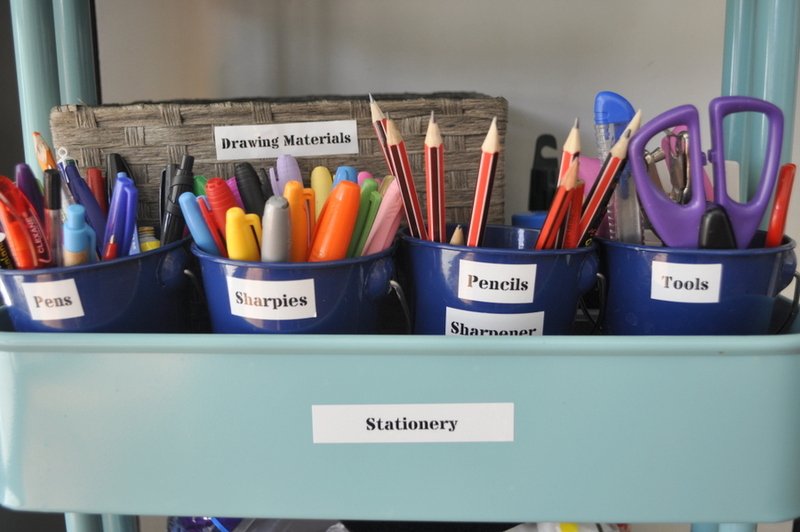 One of the best systems I established for my primary school children is a homework station. 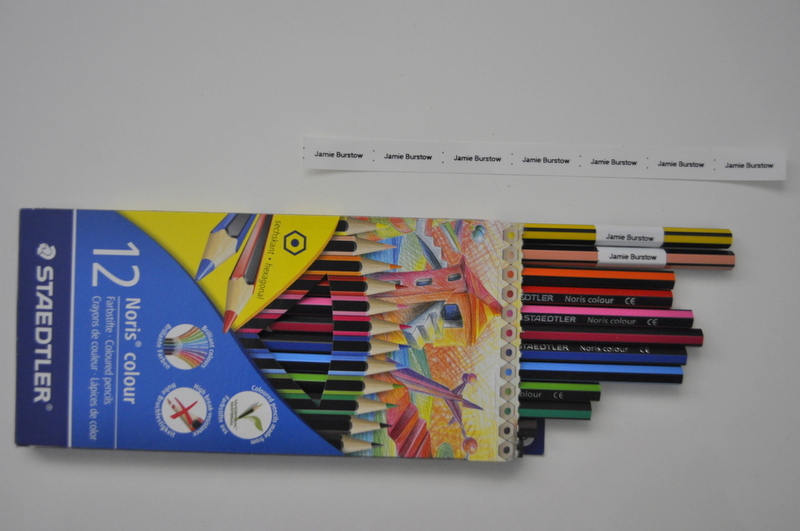 There is space for all the notes from school and their homework folders, along with everything they need from day to day. 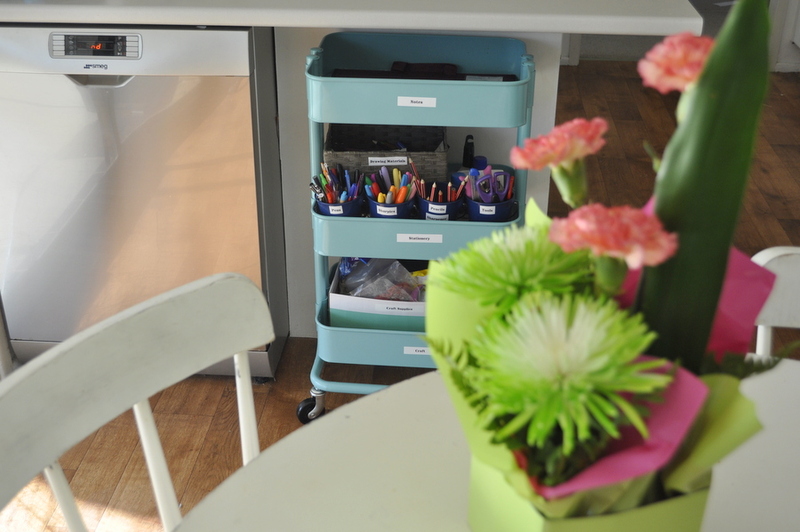 I use a RÅSKOG trolley from IKEA which sits nicely under the kitchen bench next to the table where the children do their homework. This is on wheels, so the kids can just pull the station from under the bench to the table. It works really well. The kids also use the station for their crafting and drawing. 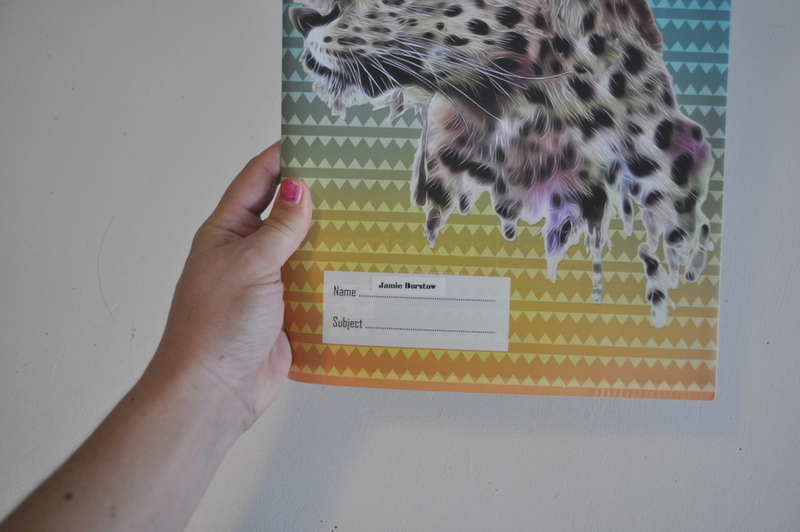 The top is used for all the school notes and homework folders. 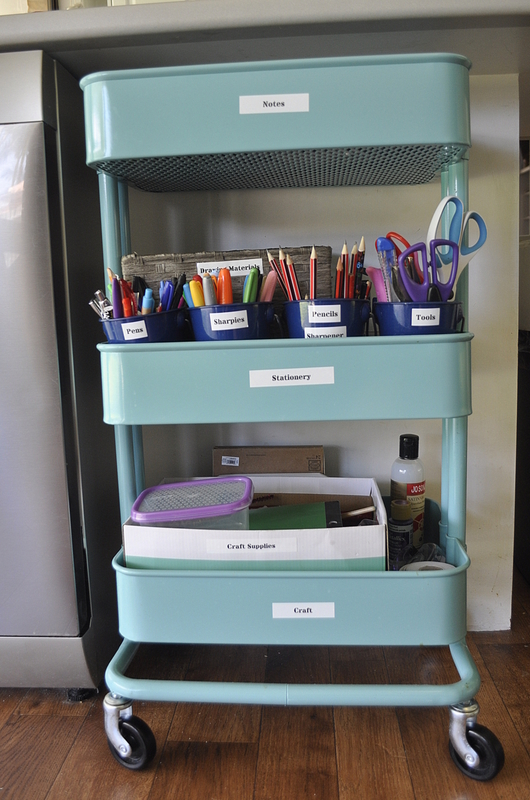 This saves paperwork being dumped on the kitchen bench. It also works well to have it in the kitchen because it’s the first place the children go when they come home (to eat). This is where all the stationery is kept. Even though my kids are used to this system, labelling each tin makes a big difference for keeping it organised so everyone in our family knows where things go. 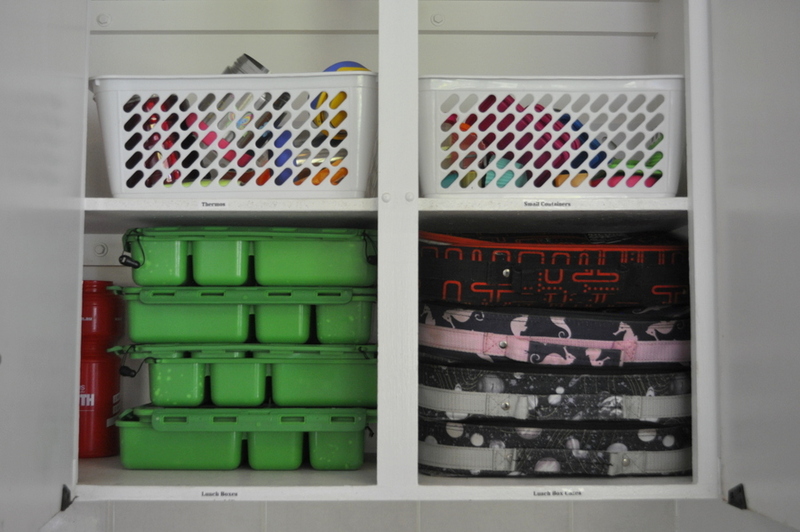 I have items in containers so the children can take out what tins they need, or grab directly from the tray. 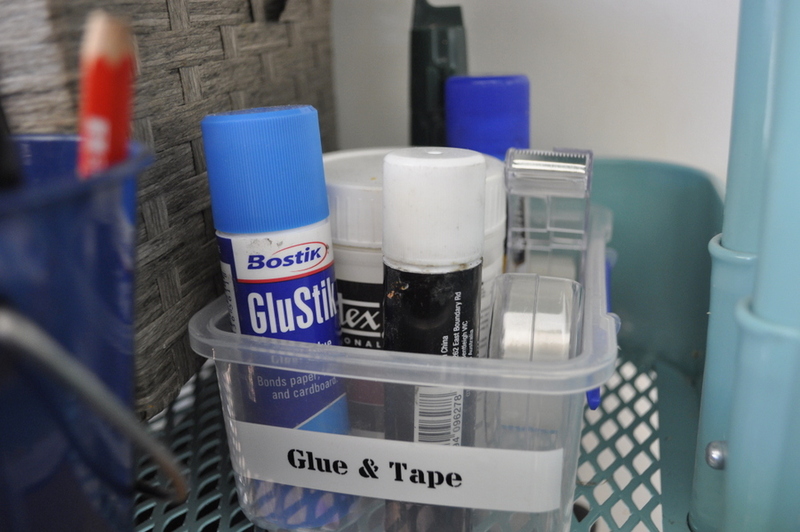 I keep a variety of craft materials in this box as well as a set of oil pastels and acrylic paint and paint brushes. 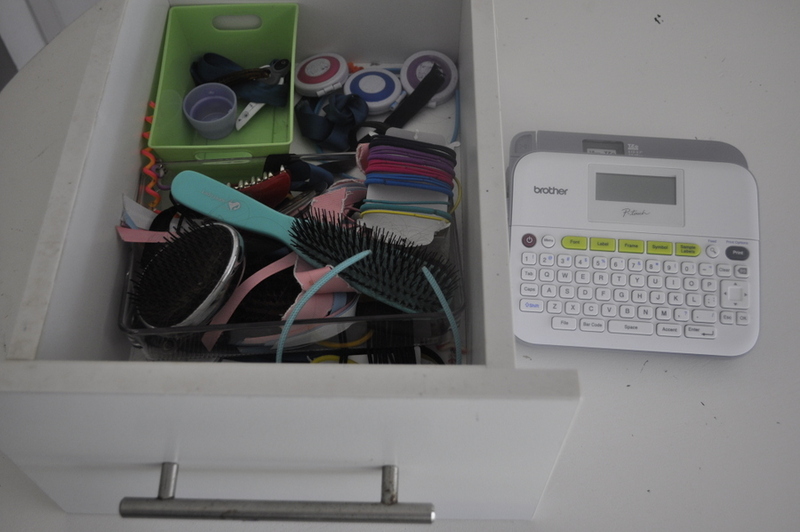 Having three girls, we have (and need) a lot of hair items. I tried to organise this drawer before but it didn’t work very well. 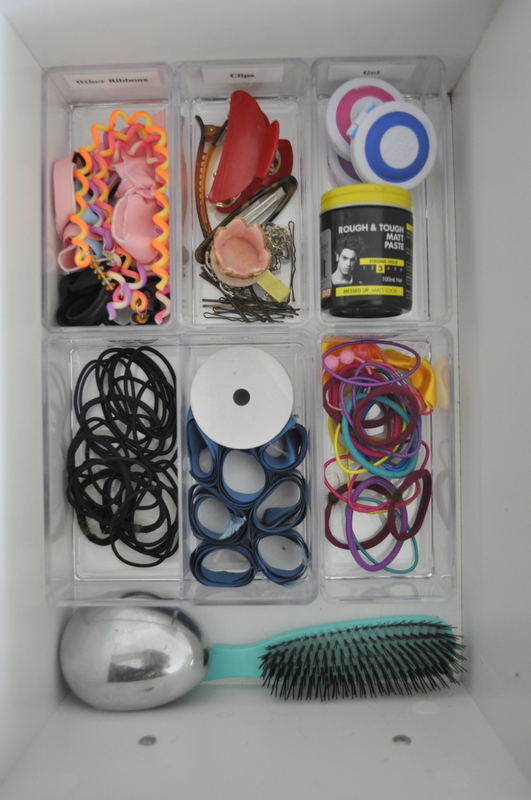 This time I’ve sectioned the drawer properly with clear containers and labelled each compartment. Looks neat and stylish now! 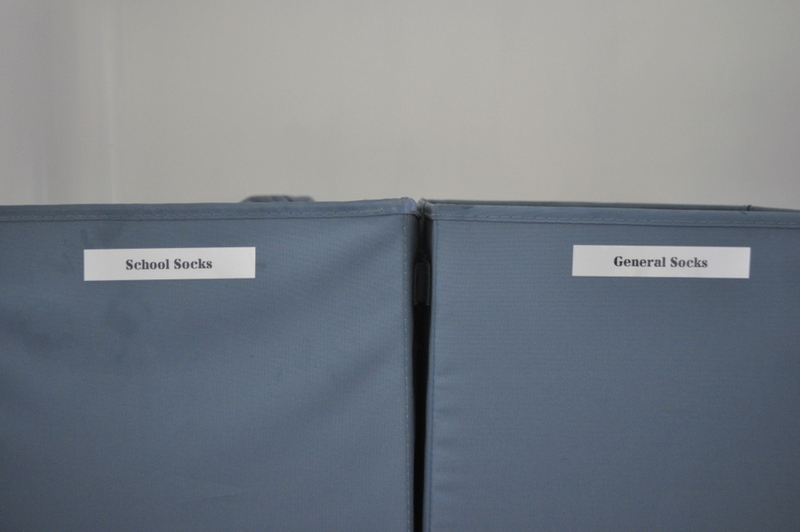 This is an area where I needed to look at because I didn’t have a dedicated area for my lunch boxes and it was chaotic. I now have dedicated shelves for different items I need for lunch boxes and have labelled respective shelves (these are only visible when the cupboards are open). I labelled all the children’s lunch boxes too. 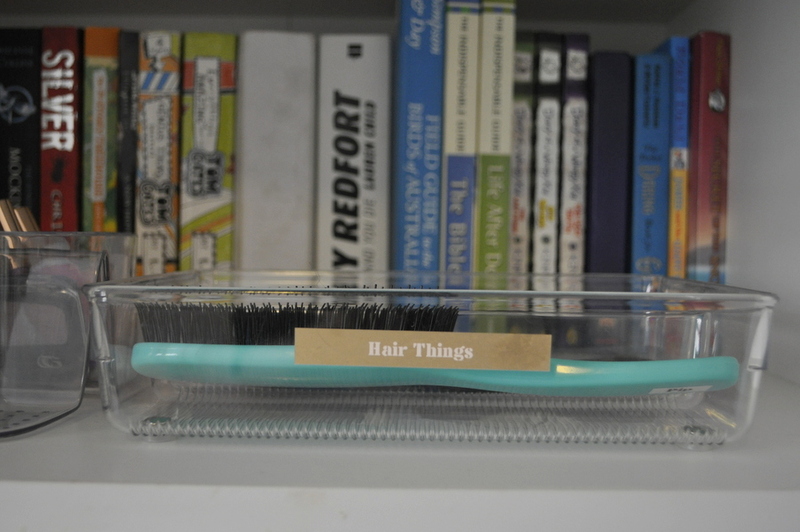 One of my teenage children likes to keep her personal items like make up and hair things in her room. I think it’s important when it comes to creating systems in the house that it works for respective children too. I used gold labels for this one and they look elegant and classy. We also keep a mini home office in one of the bedrooms with a printer and paper. 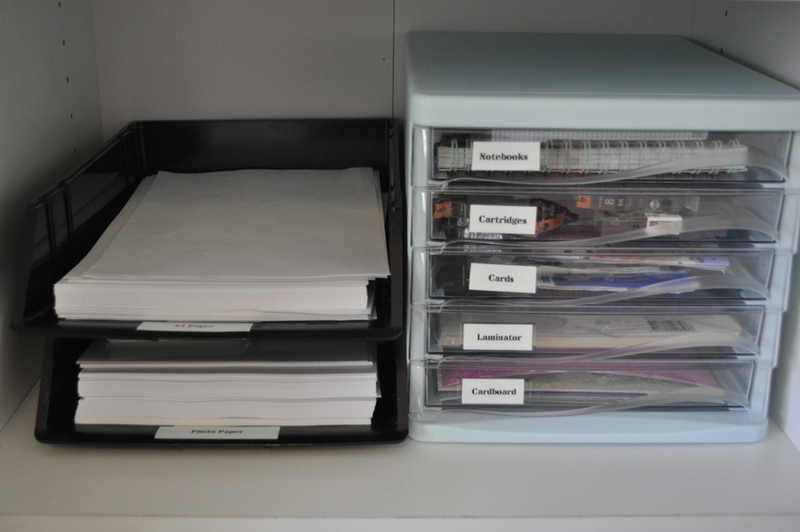 Regular and photo paper is kept in the cupboard on a shelf for anyone who needs to use the printer. Socks drive me nuts! One of the BEST things I have done to combat missing socks is to keep the socks out of the bedrooms. 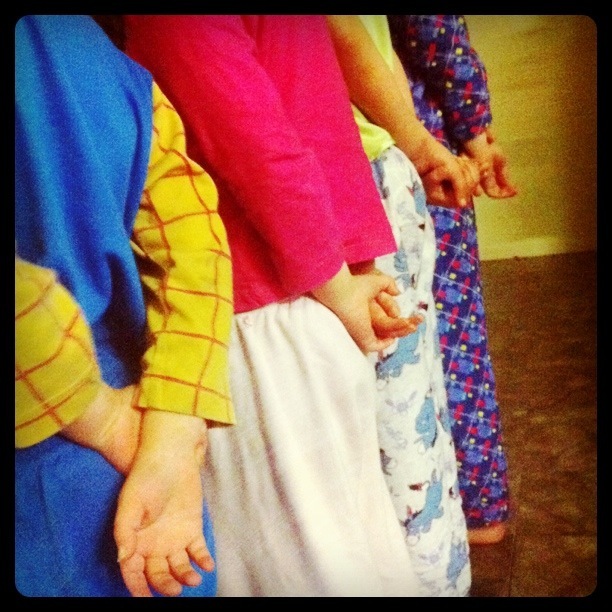 We now keep socks in containers in the laundry and the children get them directly from there when they need them. I have one dedicated to school socks and one for general socks. 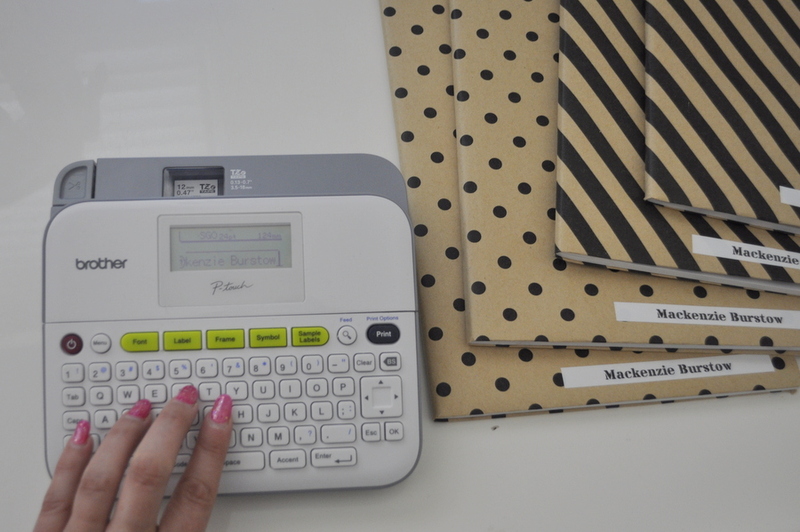 The Brother PT-D400 labeller is brilliant for labelling all the back to school stationery. So easy! 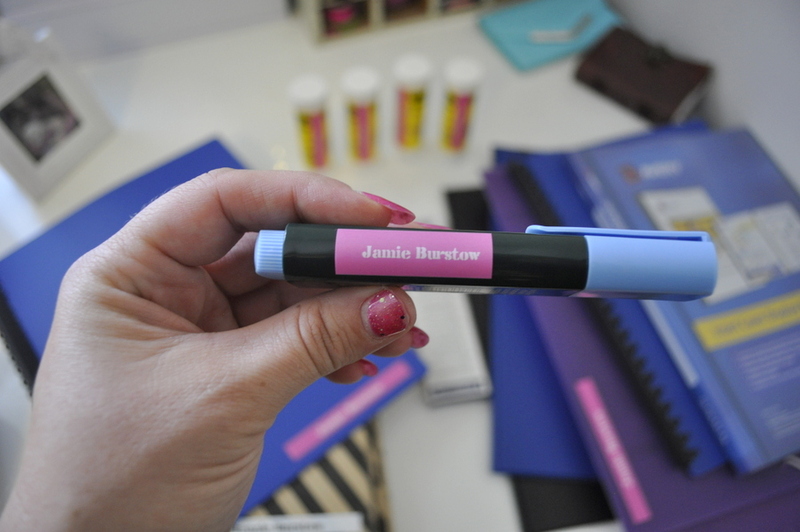 I have labelled pretty much everything with the labeller, including fiddly little things like individual pencils. 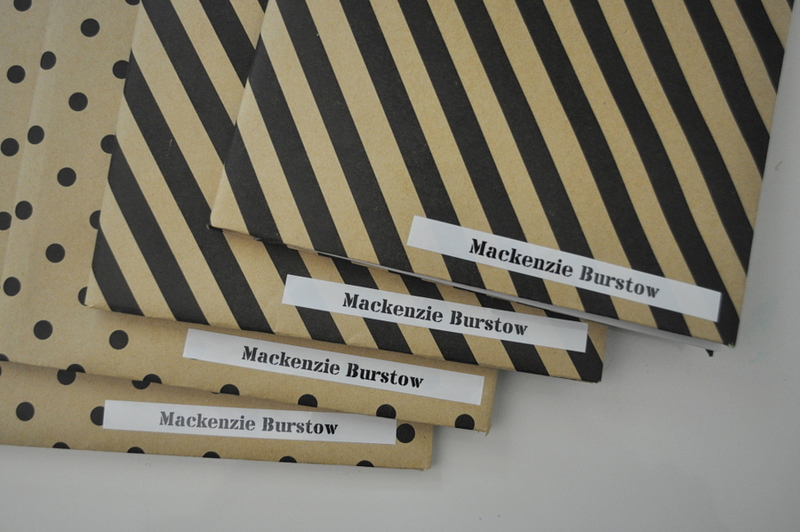 For my teenager, we covered her exercise books in paper and labelled them with her name. We left a space to also include the subject as she needs them. 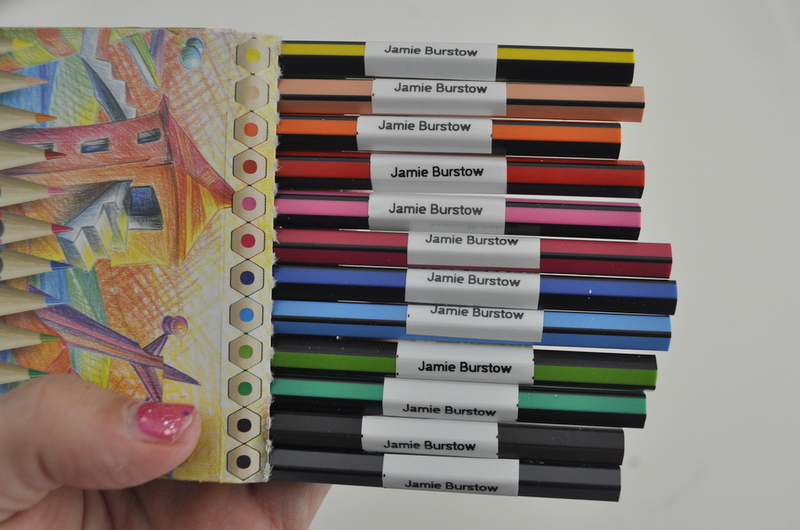 For my primary school children, I use book covers. Below are some tips I noted about using the Brother PT-D400. I used approximately 2 metres of tape cartridge to label every individual item in my child’s school stationery pack. The label backing has a split at the back which makes it easy to peel off. You don’t need to try and peel from a corner (which can affect the finished look). You can print font on two lines if desired (up to 5 lines depending on size of tape). This is handy to know for sizing the label for different items. For super small labelling, for example a scissors handle, I used a small font and then cut the label to size. Worked well. Have a ready stash of labels ready for repetitive tasks, for example, have address label stickers ready to put on the back of envelopes. Label items like electric toothbrushes that might look the same to distinguish between family members. Taking the time to organise the house before the school year adds to the harmony of the year. 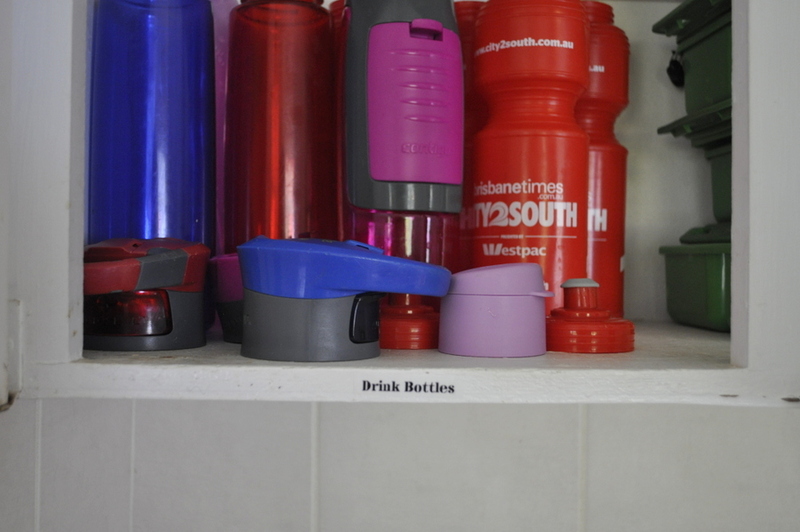 With a family of six living at our place, labelling areas means consistency. This is not designed to be restrictive, but rather the opposite: it means everyone has the freedom to find things at ease when they need them. Here’s to 2017! I’m ready. You can find more details about the Brother PT-D400 at Officeworks. What a great product! My oldest is starting school this year and I think I need to get myself one of those Brother Labeller. 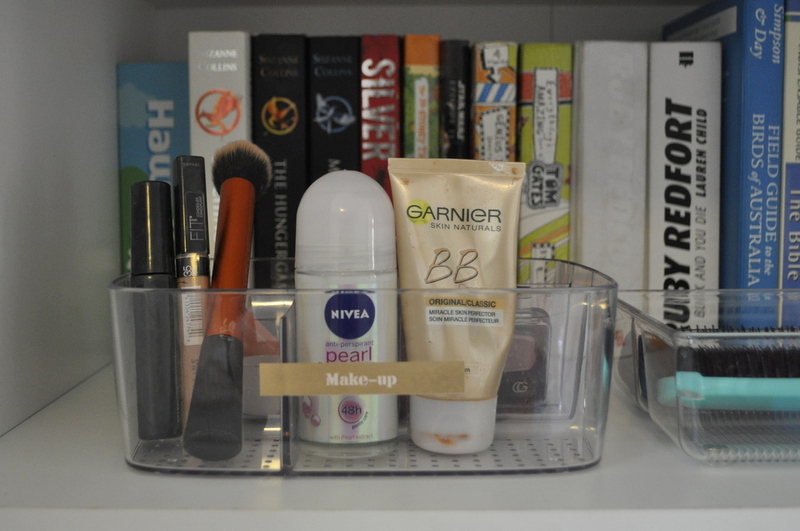 They look great and I love being organised. Thanks for the tip. I didn’t expect this benefit, but the kids are LOVING it in the first weeks of school, and anything that we missed (for example, my son’s recorder) they are labelling themselves. PLUS organising their rooms and labelling things. FTW!!! 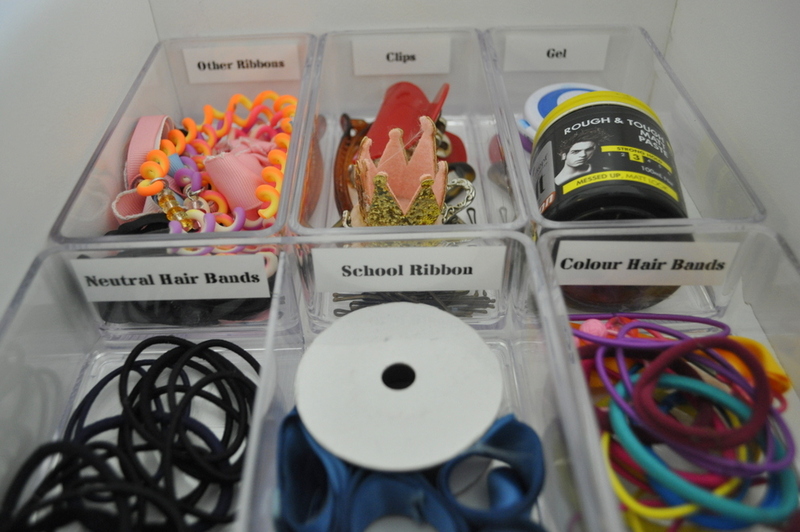 Is that a Washi tape storage system on your daughters desk? I love it! What is made from? YES! Isn’t it cute? It’s a vintage letter sorter I found at a second hand shop.